Kodi Nikorima and Anthony Milford have just five weeks to prove themselves in the Broncos’ No.6 and No.7 jerseys before coach Anthony Seibold considers dissolving the combination, says Queensland legend Wally Lewis. Brisbane struggled to make an impact in their first 40-minutes of football of the season, with a lack of creativity and spark in the middle of the park partly responsible for their 22-12 season-opener loss to the Storm. Milford and Nikorima’s performance was in stark contrast to the clinic put on by Cameron Munster and Cameron Smith, with their kicking master class exposing a considerable gap between the playmaking stocks possessed by the two sides. Lewis predicted Brisbane’s halves pairing had until Round 6 to start pulling the strings behind the Broncos talented young crop and relieve pressure on the defensive line. “It will take a while at the start of every season to adjust to the pattern of play that you may be playing,” Lewis told Wide World of Sports’ QLDER. “Of course you’ve got a new coach, there could be another style of play in there, it seemed to be a little bit different for the Broncos. That sentiment was backed up by Broncos legend Darren Lockyer who honed in on Brisbane’s floundering kicking game as their primary issue in Round 1. “For me I thought (where they went wrong) it was their first half kicking game,” he said. Friday night will present Seibold with another big challenge as his troops do battle with a revitalized Cowboys outfit in the Queensland Derby. 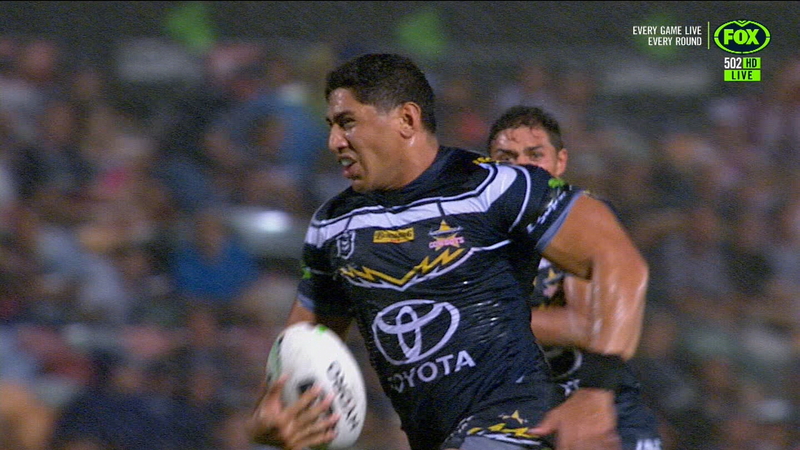 Led by 120kg wrecking ball Jason Taumalolo, North Queensland kicked off their season with a bang, with a staggering 301m to his name in an emphatic 24-12 rout of the Dragons. Star recruit Josh McGuire was a key part of that forward pack which many are touting as the strongest in the competition. The former Bronco will hope to replicate that form, alongside spearhead Taumalolo, when he comes up against his old club upon return to Suncorp Stadium. “Originally Josh McGruire who is an international was going to start on the bench but he went into the starting side and put an Origin player on the bench in Gavin cooper,” Lockyer said. “You throw in Taumalolo’s performance, Jordan Mclean, Matt Scott – it’s the best pack in the competition. Despite being without their favourite son, Johnathan Thurston, for the first time in 14-years, Lewis assured the powerful forward pack had the ability to lead the Cowboys into a new era. “Plenty of people were really concerned about not having Johnathan Thurston on board this year,” he said. “But once we saw that six taking control of that game, that was unbelievable.